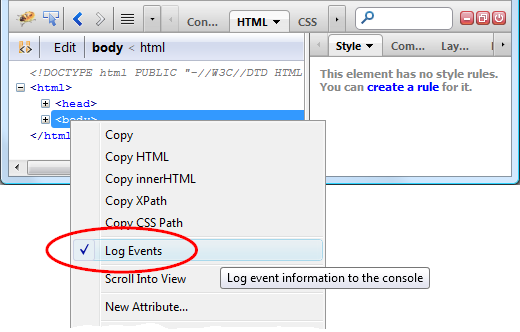 Then you could be interested in Firebug feature that allows to log function calls without changing the code! This feature is ready behind a Log Calls To ... menu item that is available if you right click on a function link (e.g. in the DOM panel). 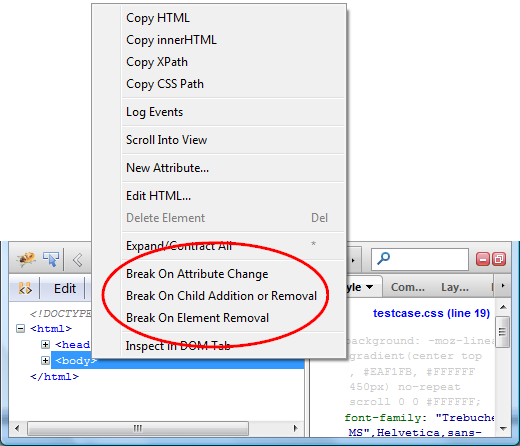 Also, ability to break on a breakpoint only if certain condition is true is useful feature and so, check out this post if you are interested how to properly create a conditional breakpoint in Firebug. This post covers three types of conditional breakpoints. One set of such features is related to XML and I'd like to describe them in this post. So, let's see what Firebug offers to developers who deal with XML! Firebug 1.10 has been released today and one of the new features introduced in this version is called Trace Styles. This feature allows tracing all places which affected specific CSS property, whether explicitly or by inheritance. The list also shows which property is actually applied. This feature is integrated into the Computed side panel (available within the HTML panel) where every CSS property is expandable. Of course, you need Firebug 1.10+ to try out this feature. Of course, this button is only available when you are stopped at a breakpoint. Lets go through real example step by step.